As a youth I grew up around almond orchards. During the early winter after harvest the pruning would begin. My brothers and I had the enviable job (read: NOT-enviable) of pulling the cut branches into the center of the rows so that a brush rake could buck it and take it to a pile where it would eventually burn. During those winter mornings in central California, it would be foggy. So much so that we could see maybe 3-4 trees ahead of us. In the fog, with near zero visibility, feet soaking wet, hands cold, it seemed that each row was endless. And to make it worse, when we finally saw the end of the row, there was only about 10ft left before we turned around and went back down another row. We learned the value of hope. When the fog lifted, we could see how much of the row was left, there was a sense of hope. When there was fog, there was no hope. It was just one foot in front of the other, over and over again. And again. Seeing the end of something brings us hope, and in that hope we can carry on. For Jesus, in His journey towards home, what was the hope? It wasn’t like He could say “If I can make it through this mock trial, then I’ll be ok,” because then it was Pilate. “If I can make it through Pilate, then I’ll be ok,” and then it was whipping. 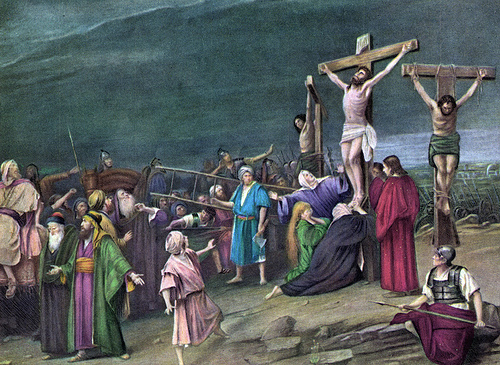 “If I can make it through the whipping…” and then it was carrying a cross to His execution. “If I can just make it to the end of this road…” and then it was nails piercing flesh. “If I can just….” but then it was suffocation and pushing up on a nail through His feet for a breath. What was the hope? To the thief on the cross He says “Today you will be with me in paradise.” That was the hope, the joy set before Him. If He could just get through these last days, He would be home with His Father. He would be home in paradise. For the joy set before me, I can endure.